For Those With Beautiful Daughters. Beautiful Thursday…my mantra. But what do I write when I haven’t felt the beauty of the emerging Spring or wanted to do anything but stare at the ceiling to try and find some hidden meaning in the blahs? Thankfully I have a thought that has been playing like a tape stuck on repeat. Speak To Her. And that’s where I’m headed on this Beautiful Thursday. I’ve spent a lot of extra time with my daughter these last two weeks. We left the boys home and drove to Florida for Spring Break (we’ve never done that before). Upon returning, and because of the boys going out of town, I’ve driven Sophie to school every morning which I don’t typically do. Our family spends tons of time together, but I sure enjoy the moments when it’s just her and I on the 30 minute drive to school. We turn the radio up, laugh, toast our day with coffee and tea, talk about school, friends, Twitter, church…you name it. It’s quite interesting to hear her stories. And then she tells me what some girls say and think about themselves and it saddens me. She doesn’t see it, but as a parent I can look from the outside and see boys hurting our girls, girls hurting each other, and girls not liking themselves. They are trying to find ways to be beautiful. So how can I use this Beautiful Thursday to make my point about our daughters? Encourage her. 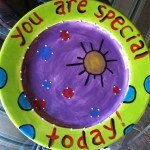 Let her eat from the You Are Special Today plate because she did well on a silly project. Know her heart. Ask her what her dreams are and don’t make light of them. They may sound silly to you but let her dream. Encourage her that God has a course for her life and He knows her heart and can help her do powerful things. Face it…she is not going to do what YOU want her to; she has dreams of her own and she needs your support as she grows into those dreams. Know where she is headed and follow her. Be her safety net, help her navigate, but let her chart her course. If you don’t follow her because her interests don’t interest you, she will search until she finds someone willing to follow her. I don’t mean follow her around and make her decisions. I mean allow her to step out on her own in the proper circumstances and just follow where her heart leads. If you don’t, there are a hundred other people more popular than you, wealthier than you, younger than you, and who have platinum records that will beckon her to follow them. And she will because you will be in some other place trying to lay the ground work for what YOU want her to do. She is not you. She is herself and that in itself is beautiful. Face it. Many influences define beauty for our girls today but none can challenge the impact your simple words will have on her. Tell her she is beautiful. She needs to hear this from her dad. Her mom. Speak to her. Write it in a letter. Post it on her wall. Tape it to her mirror. Put your phone down and cancel your next meeting to be with her. I guess you could tell her next week or on her next birthday. Or when it’s too late. Love this! You are a perfect example of all that mom’s can be! Thanks, Michelle. When Sophie was little, I don’t think I ever realized what she’d be up against! What a joy to parent a daughter…as you know! As usual, insightful and right on!! YOU are special today!! Thanks, Auntie JJ! Do you like the part about “if she bites her nails”??? This is SOOOO good. I would also add, “For those with beautiful step-daughters, god daughters, friends’ daughters…” Our words affect. That is true, Ginger. I hope people can see that “daughter” is all emcompassing, plus it covers the entire span of our lives as daughters. We are never too old to need a parent to affirm us. I pray we hold our girls close and stay even closer to the Father as we do our best to raise them. We have the great privilege of being soul shapers. I love that we have the special task of speaking truth, life, and beauty in our daughters lives… in spite of the chaos. Kim, this post is right on. Our daughters have so much to fight and live up to because of what our culture teaches them. They really do need to hear our sincere words of encouragement and support. Thank you for your gifts that bring us to the place we need to be. Thanks, Jan. I am fully aware that my words often fall on unlistening ears, but I have to trust that what I tell Sophie will affect her heart ultimately. Our girls are precious but I sure don’t remember it being this difficult when I was younger…well, come to think of it!! Thanks for reading! This is so right on! As I read it, I compared how I was raised to how I raised my daughter (and son). I hardly ever heard anything positive or affirming growing up. I don’t ever remember being told I was beautiful. Needless to say I spent most of my life in search of positive and affirming words. Approval, so to speak. So…I probably have gone overboard with my daughter to make sure she never experienced what I did. She is 25 years old now. And she is a confident young woman who is comfortable in her own skin. She sometimes can be a little hard on herself. That is because of peers and others in her life who don’t always say nice things to her. But, because she has been raised to believe in herself, she can shake it off and move on. Love your blog and I love you! Charlotte…wow. What else can I say? The power comes from you realizing you had the strength to do things differently and you did it. I don’t think it’s possible to go overboard with the affirming words–it seems they are bombarded with so much negative these days that whatever we can do to combat that the better. I see the love and adoration your kids have for you and that is a testament to you as a mom. You are so beautiful, inside and out, and I am blessed to know you! Love you lots. Thanks for taking the time to read this, Karin. It hardly seems right that we’re parenting girls…weren’t we just there ourselves?? Our girls have such pressure on them these days and I’m learning, like you, to simply encourage her spirit and then (but it’s sooo difficult) allow her to muddle her way through the rough waters of life, relationships, friendships. Everything we went through and got through, praise God, without too much scarring!! I heard from your mom too; what a nice surprise! I appreciate you sharing. You are a wonderful writer, true spirited messages.Have you thought of ever compiling them into a book. My daughter Karin told me about you blog and your very thoughtful essays are wonderful to read. Hi Kim, the way to do a book is to find all of your stories with a common theme and put them together and edit, edit, edit. You are way too good of a writer to let them collect dust. Good luck, keep writing. Wow, just read this today…it was meant to be. My daughter and I, just yesterday were talking about the classes she wishes to take her junior year…dual enrollment over the summer, AP and Honors classes, and NO electives, (just more AP and Honors classes). The first thing I said was that her schedule would be too overwhelming and there would be no time for social activities, and I asked what her Plan B was going to be. Later in the evening she let me know that she needed my support, not my “shielding” her from POSSIBLE hardship. She asked that I allow her to do what is her desire…when did they get so smart? Yes, perfect timing! I’m proud of you for letting her go in this area; I’m sure she gets her smarts from her wonderful Mom! I know she will make you proud because you have raised her right and now it’s her chance to step out (and of course, we all know that we will never be that far away to catch them if they need it). Now it’s up to us to pray for them–the greatest thing we can do. Love you!